In this is the second part of an in-depth review of 'Dr. 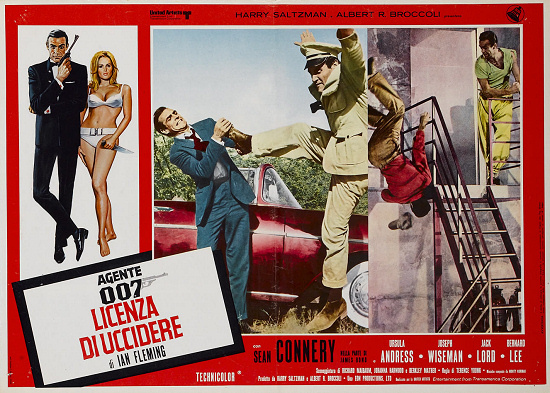 No', we focus on James Bond's adversaries: Dr. No himself, and his henchmen. Professor Dent & Mr. Jones - For this entry, I’m including Professor Dent AND Mr. Jones, simply because I love the chauffeur and what he unconsciously represents in the film, for however briefly. Starting with Professor Dent, Anthony Dawson’s talent for character roles is widely visible here as he takes on this understated but absolutely crucial role in Dr. No. 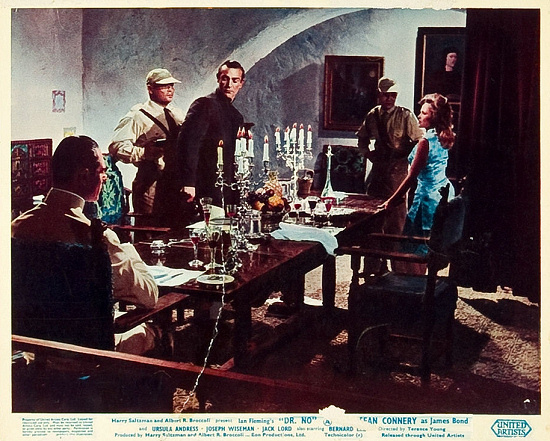 In a layered performance not unlike Connery’s, Dawson gave Dent the perfect mix of the intellect of a scientist, the two-faced nature of a scheme obstructing Bond, and the crippling fear of a man who is in way over his head while working underneath Dr. No and SPECTRE. 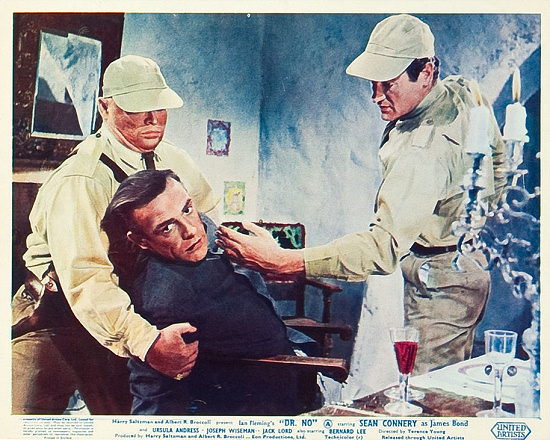 Professor Dent is an important character in this film because through his eyes, we see the power and influence and fear Dr. No commands to his underlings. His meek and fearful demeanor as he enters the anteroom and hears No’s booming and robotic voice is telling, as is his anxiety-racked face as he is forced to pick up the tarantula cage. He’s the perfect example of a pawn in a greater organization, a lower-level operative of SPECTRE who knows his place all too well, and we get a good sense that the anxiety of the job has more than worn on him by the time he and Bond cross paths. What makes Dent enter the Bond history books forever, however, is the famous “You’ve had your six” scene. Two Walther shots to the torso after being duped by Bond is a fitting and slightly comical end to Dent, as he is fundamentally a man so used to taking orders that he lacks the stomach and strategy to mount his own schemes, especially when the man he plans to ensnare is as capable a force as what Bond represents. Dent tried to play Bond’s game, which was his first and last mistake when dealing with this particular 00 agent, who authored the playbook. I wanted to include Mr. Jones here for a brief moment too, because, in the nascent days of Bond’s cinematic history that Dr. No represents, he’s the closest thing to a henchman we’ve got in this adventure. And though his time on screen is fleeting, the actor Reginald Carter makes good use of it. I love how Bond spots the trap laid by Jones and makes a call to the MI6 affiliate in Jamaica to confirm his suspicions. What I love more is the confidence Bond carries as he jumps willingly into the car with Jones and acts as his passenger, though he knows that any moment death could come to him. 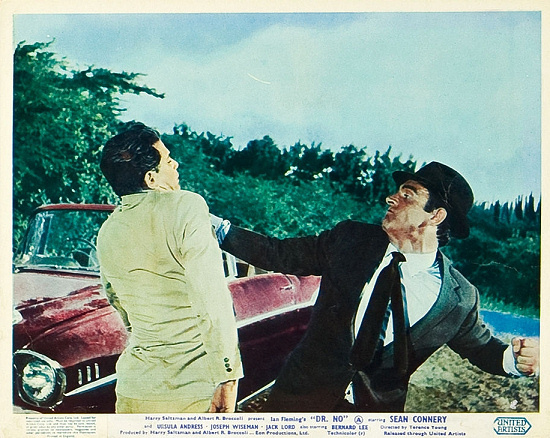 The ensuing dialogue (“I’m a very nervous passenger”) and Bob Simmons’ debut action sequence in the Bond series makes for engrossing cinema. My favorite aspect of Jones’ character, however, is how he tricks Bond into giving him one last request of a cigarette, which Bond respectfully allows him to have, unaware that it’s laced with cyanide. Jones is vital and interesting in the plot of Dr. No because he is the first unconscious sign Bond meets in Jamaica of the overwhelming conspiracy he’s entangling himself in by investigating the mysterious murder of Strangways. Jones’ desire to do anything, even face death itself to escape questioning and the wrath of his master is Bond’s first sign of many that point to the fear and power that Dr. No is capable of spreading amongst his foot soldiers. Though he is a small part of a larger puzzle, Jones’ demise and fear builds up the mythic quality of the man who has a grip on Crab Key, the surrounding landmasses and the people that populate them. Dr. No - The biggie, the one that started it all. It’s amazing to look back on the history of James Bond in cinema, and see its beginning here in Dr. No. It’s just as amazing to note the massive ripple effect actor Joseph Wiseman had as the very first baddie of them all in setting the stage for what it means to be a James Bond villain. It’s funny to learn of Wiseman’s nervousness at taking the part and the feeling he had at the time that the role would be nothing more than a “grade-B Charlie Chan mystery.” And yet, in his final on-screen performance as Dr. No, none of the anxiety, reluctance or uncertainty Wiseman experienced on set is visible. What is visible, however, is an iconic performance that brought the baddie to life and sparked a vast and colorful tradition of great villains in the franchise forever past him. If science were a man, Dr. No is the form it would take, and this idea is visible in Wiseman’s performance, through which he gave the man a frigid demeanor, a booming and robotic tone, and a delicate, near paper thin ego that he leaves vulnerable for Bond’s puncturing. Wiseman’s No also set the stage for the now iconic interactions between Bond and his villains that we have come to expect from the franchise. Instead of shooting each other on sight or wrestling in sudden death on the floor until a victor was named, No and Bond put aside their differences and numerous attempts to foil each other’s plans to have a respectable dinner. The true majesty of No’s character is in how he treats Bond different from all the rest of the Bond villains, even just in the Connery era. He saps the radiation from Bond and his friend (that sounds weird), provides them with a nice room of ultra comfortable means, fresh sets of clothes in their exact sizes and even a spot to wash up at. Most of all, however, while Red Grant gets a sick pleasure out of making Bond beg for mercy, Goldfinger relishes nearly bisecting him and Largo has a visible and intense sense of distaste for Bond through his fake pleasantries, it is Dr. No and only Dr. No who puts aside his differences with Bond to - if you can believe it - recruit the agent for a position in SPECTRE while sharing a five-star meal with the man. What makes Dr. No so amazing as a character is the fact that he is willing to forgive the employees, finances, and operations of his that Bond has maimed, burnt and foiled irrevocably, treating them instead as quasi-training exercises or initiations that proved to him Bond had what it took to join his organization as a promising partner. It’s a delight, then, to watch Bond throw the recruitment back into his face coldly as the calm relations between the two crumble to ash as Honey is whisked away and Bond makes a move to either stab his way out or use the bottle of Dom Pérignon 55 as a temporary blunt instrument. Lastly, I love how dispassionate No is to the causes of the world, and how he’s turned his back on working for nations entirely - calling them all just points on the compass - to work above it all in SPECTRE, where he calls his own shots and is valued for the skills the west and east turned their backs on. It’s important that No is the first SPECTRE agent we see in the Bond films, because his personality and what kind of people the organization seeks to employ gives us a great idea about just what Blofeld dreamed for it to grow into as its acting figurehead: to become a collective of powerful men beyond the control of nations and flags, a group without land, country or loyalty to anyone but their inner circle, working in secret to exert their force, a shadow in the dark of the night. Part two will cover 007's friends and allies in 'Dr. No'.